If you are preparing to attempt the CCNA (200-120) Exam, then you must prepare for access-list, because in every exam there is a lab related to assess-list where you have to complete the configuration in order to make the access-list working. 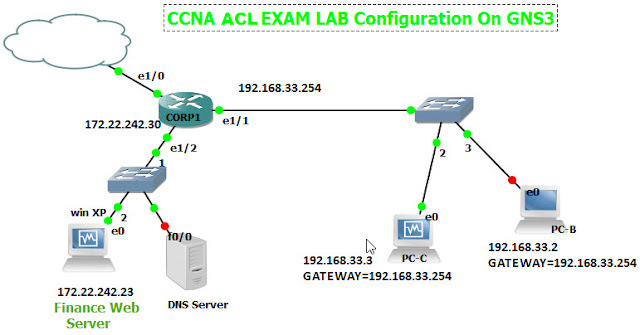 I have created the similar lab in GNS3 so that you can practice it before going into the real Exam. The user on host C must be able to use a web browser to access financial information from the Finance Web Server. 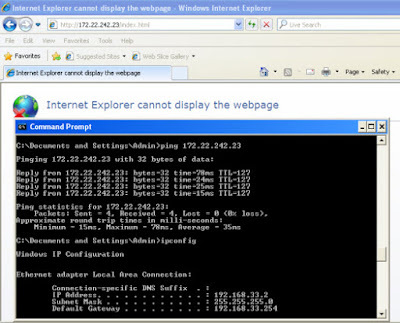 No other hosts from the LAN nor the Core should be able to use a web browser to access this server. YOU ARE required to apply an access-list with no more than three statements that will allow ONLY host C web access to the Finance Web Server. No other hosts will have web from Finance Web Server. All other traffic is permitted. 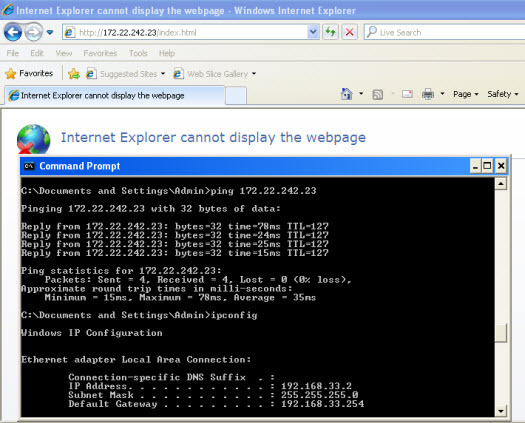 The Core user have the IP-address of 198.18.196.65. LAN PCs have been assigned with IP addresses range from 192.168.33.1 - 192.168.33.254. The Finance Web-Server has been assigned with IP address of 172.22.242.23. This command will allow the web traffic to finance web server, Where 192.168.33.3 is the IP address of host C.
Above command will allow the any other traffic. You can access the web only from 192.168.33.3 to Finance Web Server. 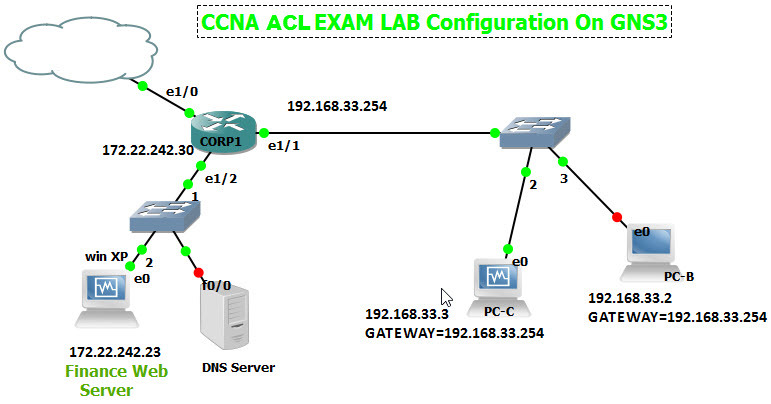 If you have some extra time you can configure this lab in GNS3… J You can also configure it with packet-tracer which is easy as compare to GNs3 But I have configured the same lab in Gns3, you can download these configuration files from here and can complete it with above configurations. Simply download the files (link are given at the end of post), create the topology same like shown in the figure and then upload these files on every router one by one. This will provide the initial practice before going into the real exam. IN GNS3 For making the communications between Corp1, Lan Hosts (A,B,C,D) and finance servers I have configured the EIGRP AS 100, while in the real lab you have the by default communication between these devices. For creating the web service on finance server I simply install the IIS and hosted a web-page named index.html. 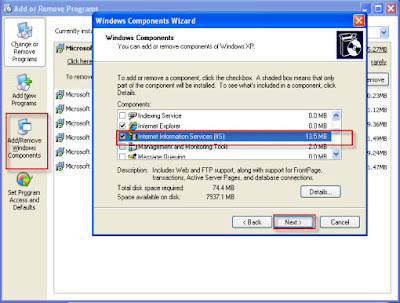 You can install the IIS on windows XP from control panel\add & remove feautures\add&remove windows components and the select the IIS and click on next and complete the wizard. I have created a web-page (index.html) for test and place it on c:\inetpub\wwwroot of finance web-server. After completing the above configuration you can test the configuration with the followiway. 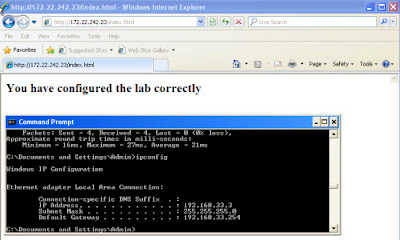 open the internet explorer and access the shared web page with URL “172.22.242.23\index.html”, it will be successful from host-c as shown in figure. Now try the same from Host-b page will be inaccessible.